Appeal to Ignorance is an argument that asserts that something is true because it hasn’t been proven false, or something is false because it hasn’t been proven to be true. This reasoning is problematic because it ignores the possibility that the truth or falsity of something might just not be known yet. Or that something may be incredibly difficult or impossible to know. This argument shifts the burden of proof to the opposite position instead of providing evidence to support their own position. Hmm, what are your thoughts on the artwork? 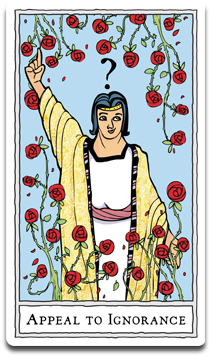 It’s parody of this (http://www.learntarot.com/bigjpgs/maj01.jpg).